Dog doors are becoming a standard installation in most modern homes. If you own a dog, it would be a good idea to install a pet door which would give the dog freedom of movement to access your compound and back to the house with no challenges. Finding the best doors for the cold season is an uphill task. We have a review of some of the top rated dog doors for severe weather in this article. There are different types of dog doors that you can get in the market, and this article may assist you in making the appropriate decision for choosing the best dog doors for cold weather. If you have dogs of different sizes, you may want a dog door that would easily offer access to all of them. The PetSafe dog door is one of the best options that you have in the market since it can accommodate dogs of all sizes. Controlled Access – The PetSafe Freedom slide-in dog door allows one to control the access of their dog. If you would want your dog to have restricted movement at particular times of the day, the controlling feature will work well for you. Also, when you are travelling, you can lock the dog door to ensure your house is safe. Energy Control – This feature makes PetSafe one of the best doors for the cold season. The flap of the door has a magnetic chip which keeps the door closed at all times. It also has a weather strip which is useful in preventing the external cold or hot conditions from entering the house. Aluminum Frame – The aluminium frame used to make this dog door is sturdy hence offers the required rigidity. The frame is fitted with tempered glass which makes it capable of work in harsh conditions. Aluminium doesn’t rust easily and thus can serve you for a longer duration. Portable – The PetSafe dog door is portable meaning that you can move with it from one apartment to another. The design makes it a perfect choice for anyone who stays in rented houses. The process of installation is also natural, and you don’t need a technician to install the dog door for you. Summary: PetSafe is one quality dog door which can be useful during the cold season and also on standard walls or doors. You will have different sizes from which you can choose the most appropriate for your dog and even a perfect color for the door. 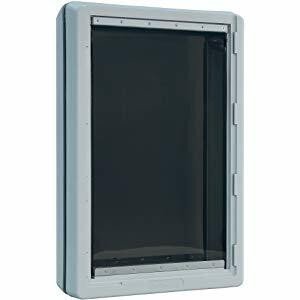 Check PetSafe Glass Door Now From Amazon! The Ideal Pet Ruff-Weather dog door comes in four different sizes. The dog door is of high-quality, and its functioning is impressive when compared to most pet doors in the market. 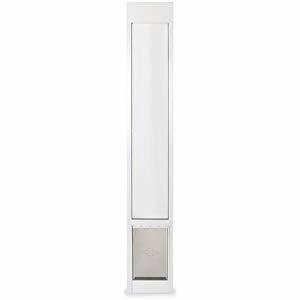 Telescopic frame – The frame of the dog door plays a significant role in making it energy efficient and also compatible with standard doors or walls. The structure creates a 3″ gap between the two flaps and hence create an air gap. Its installation is easy, and the manual can guide you on how to fit it on your door. Weather Resistance- The telescopic frame of this door is thermal protective. There is an air pocket between the two flaps. The artificial air pocket between the two flaps ensures that there is no escape of warm air from the house. Magnetic Flap – The door has a magnetic chip on both flaps which ensure that they are closed at all times. It would ensure that the cover doesn’t remain open during the cold season. It also prevents the entry of any unwanted elements in the house. Rigid Lock-out – The door has a slide-in shutter which acts as a seal when the door isn’t in use. You can use the panel to lock your pet in the house. Also, when you are away for some time, you may use the shutter for enhanced security. Summary: The door is cheap, and the telescopic frame design is impressive for houses with standard doors. You can easily fit the door since it comes with a user manual. Check Ideal Pet Products Door Now From Amazon! Are you looking for a quality dog door for the cold weather? Well, this freedom pet dog door is made from fantastic technology which makes it a good choice for extreme climatic conditions. DoubleMag Technology – This technology is a face to face seal made from a magnet. The seal is energy efficient and makes the door weatherproof and also airtight. The seal offers up to 15 times more power controlling efficiency. Insulated Flaps – The flaps used for this particular dog door can support temperatures as low as -40F. The flaps ensure that your house can stay warm and comfortable even in extreme climatic conditions. The flaps remain closed at all times due to the DoubleMag seals. Cellular PVC Frame – The use of cellular PVC is an outstanding feature since the majority of the dog doors use aluminum frames. The door has a higher resistance factor when compared to other dog doors. The R-factor makes it useful in cold climatic conditions since its heat losing capability is low. 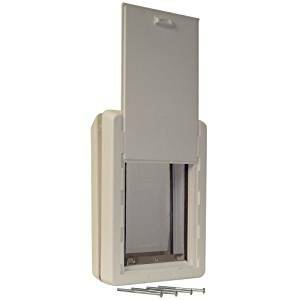 Lock-Out Panel – The door comes with an acrylic lock-out panel which offers extra security to the homeowner. You can use the lock-out door if you are away or want to keep your dog in the house. Also, the dog door is easy to use, and the acrylic material makes it more energy efficient. Durable – The door is made from high-quality material which can serve in any harsh conditions. The materials are also resistant to corrosion which means they can help you for long. Some of the primary materials used on its manufacture are cellular PVC, marine-grade canvas and also industrial TPO. Summary: The Freedom Dog door is one of the premium quality dog doors which can be useful in extreme cold and hot weather. If you can afford the price, then this is the dog door you need for extreme climates. Check Weather Dog Door Now From Amazon! A dog can be playful and can’t stick in one place and having a dog door would be a perfect idea. You no longer need to take the dog out for its play time. Moulded-Foam Plastic – The door is made from moulded from plastic which makes it robust and secure. The moulded-foam plastic is made from a low-pressure manufacturing process. It’s lightweight and durable to serve you for a long time. Double Flaps – This dog door has two flaps which are made from vinyl material. The folds create an air pocket which is in between which creates air insulation. These flaps make the door to be energy efficient and still works as a suitable passage for the dog. Magnetic Flaps – The flaps have magnetic strips for enhanced security. Once the dog pushes through the covers, the magnets attract each other and keep the door hole closed at all times. It would ensure no unwanted elements pass through the door and make sure its energy efficient during the cold season. Waterproof – The flaps are made from vinyl material, and the frame of the dog door is insulated which protects it from rainwater. If your dog goes out during the rainy season, any wetness smeared on the door will not affect at all. Also, rain can reach the door, and since its insulated, it can’t be affected by the splashing water. Summary: If you need a silent, energy efficient and waterproof dog door, then this can be your perfect choice. It’s made from durable material and your dog can use it for an extended period. Check Energy Efficient Dog Door Now From Amazon! Are you searching for a durable dog door for your dog? Well, Plexidor has one of the best cold weather dog door you can get in the market. The doors are of different sizes and very tough even to withstand a massive dog. Shatter-Proof Panels – The door is made from a hardy and military grade material. The material ensures that even the violent and massive doors can’t break the panels. The components used also offers the necessary insulation during cold and scorching conditions. Versatile – The dog door can fit on different designs of standard household doors. 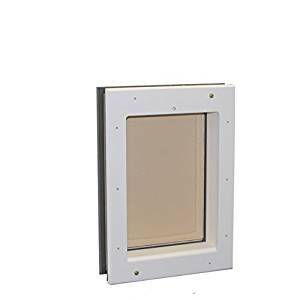 If you are searching for a dog door that can fit on your fiberglass, steel, glass or wooden door, then this may serve the purpose. The procedure for installing the door is straightforward since it comes with a user manual that may guide you. Swing Door Design – The dog swing design makes it more durable and comfortable for the dog to pass through. Flaps tend to tear over time, unlike the swing door design. The saloon-style doors act as an excellent thermal insulator. Weatherproof – The frames of these doors are made from aluminum and are well insulated. It makes them weather-proof and can serve you for a longer duration. The dog doors also have a variety of choices you can pick from like the bronze design, but the insulation done is all the same. Summary: Dogs are active and playful and may need extra outdoor space to play. If you have a massive dog, then this would be the best pet door for your dog. 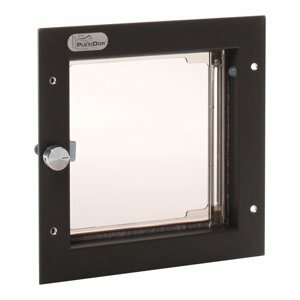 Check Plexidor Dog Door Now From Amazon! If you search online for the premium quality dog doors for the cold weather, you may get a lot of results. The results may not give you what you want for your dog. If you need a fantastic dog door for the cold weather, you need to be knowledgeable, and this buying guide may give you the necessary tips. Energy Efficiency – When buying a dog door for the cold weather, this should be the main factor to consider. The safety locking mechanism of these doors determines how much you will spend on your heating bills. There are magnetic and electric safety lock mechanisms used on these doors. Quality of The Material Used – For the safety of your dog and also minimal maintenance, it would be a good idea to purchase a dog door made from premium materials. The materials should be weather resistant and also rust resistant. The components should be non-toxic since it may affect your dog. Size of the Dog – When shopping for the dog’s door, it would be good to consider its size. If it’s a puppy, you can buy a door that is big since dogs grow fast and it might outgrow the door if it’s small. Measure the size of the dog and check the door specifications for its size before purchasing. Frame Structure – The structure of the frame matters a lot on how robust and long-lasting the dog door can be. If the frame material is a non-metal it would be an excellent weatherproof door and also offer a sturdy structure. If you need a structure that can be adjusted and fit into different sized standard doors, you can purchase the telescopic dog doors. Insulation – Insulation goes a long way in ensuring that the dog door doesn’t lose any warm air to the cold exterior environment. Double flaps are used in telescopic doors to ensure they offer maximum insulation from the cold weather. Other designs are automated which opens the fold for the dog to pass through the door. Having a dog door at your house doesn’t only let your dog out. It saves a lot of time which you would be spending to open for your dog. An excellent dog door will help you reduce energy costs in the cold weather since the energy lost will be very minimal. You need to be knowledgeable for you to get the precise pet door for your lovely dog. There are different types of entries in the market and to avoid disappointments, it would be good to research deeply. This article gives you a review of the best dog door for cold weather which might be helpful.